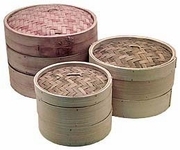 The bamboo steamers allow the cook to prepare multiple dishes at once by stacking layer upon layer of bamboo racks. This extremely efficient system requires only one burner and one pan. Each dish (set in its own rack) can be cooked in its own time and as many racks as needed can be added. One set consists of two racks and one lid. Individual racks and lids can be purchased separately. Bamboo Steamer Set, 5 pcs.